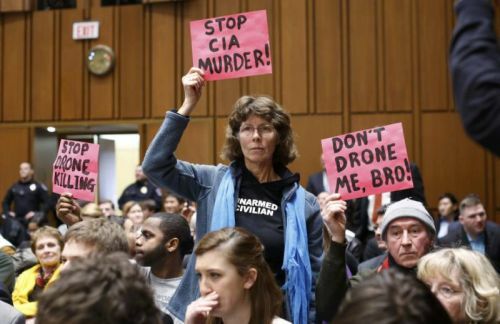 The noisy appearance of several activists from CODEPINK at last week's Senate hearings on the confirmation of John Brennan as Director of the C.I.A. was welcome for calling attention to the immoral, extra-judicial use of pilot-less drones by the U.S. Government to murder people -- citizens and foreign nationals, adults and children -- that "high government officials" suspect of being associated with al-Qaeda. But as the protesters were being physically ejected from the room, it occurred to me that they'd also called mind a crucial but widely scorned feature of democratic freedom -- skillfully targeted heckling. Those who disrupt public hearings, lectures, and other gatherings with shouts and posters critical of dignitaries at the front of room are often derided as enemies of free speech, ones who seek to destroy open discussion of crucial political issues. Objections of this kind arose during incidents of heckling directed at Mitt Romney and Barack Obama during the 2012 presidential election campaign. Thus, at a political rally in Richmond Virginia shortly after the devastation of Hurricane Sandy, Romney encouraged the crowd to help by donating to the Red Cross. But, as one news story reported: "Amid the applause, ...[a] heckler shouted, “What about climate? What about climate? That’s what caused this monster storm. Climate change.” The man, who was holding sign that read “END CLIMATE SILENCE” was immediately booed and drowned out by “USA” chants. He was escorted out of the event." Press coverage of incident lamented the breakdown of respectful civility the speech, but seemed little concerned that, as the heckler pointed out, Mr. Romney had nothing to say about what is probably the greatest crisis facing humanity at present. In a similar incident, Barack Obama was heckled during a speech in March 2012 at Ohio State, first by a man shouting and waving a book and later by protesters chanting "block the pipeline,” referring to the Keystone XL project. Obama's cool, calm response was typical of well coached responses by those who are targets of heckling, namely to stress the crucial need for decorum as well respect for the speaker and listeners in the audience. "Sir, I'm here to speak to these folks." Obama said. "You can hold your own rally. You're being rude. ... I'm trying to talk to these people." At one level such criticisms of heckling seem perfectly reasonable. Indeed, it's clear that open debate and reasoned discourse would suffer if incessant verbal interruptions permanently interrupted or frequently shut down public gatherings. Yes, there are numerous cases in modern history in which political thugs have busted up the meetings of their opponents through shouting, physical intimidation and worse. By no means would I endorse malicious behavior of that kind. But outrages of that sort are not what happens in most instances of heckling in public meetings and speeches. What commonly occurs is that persons in the crowd speak out, loudly but briefly, offering relevant, sometimes irreverent, contributions to the discussion, ones at odds with themes the speaker or event organizers hoped to publicize. But, you may ask, isn’t this unwelcome and destructive? Doesn't the presence of hecklers in the room threaten the right of free speech? Isn't that a right we need to defend from any and all kinds of interference? My answer is that the right of free speech also includes the rights of listeners to respond vocally to statements and positions they find morally or politically offensive and to do that right on the spot. Is there an obligation to sit quietly at attention as a speaker offers flagrant misrepresentations of the truth or advocates contemptible positions? Is there something sacred about the location or vocation of the speaker that imposes respectful, appreciative silence? Where in the Bill of Rights is a compliant attitude of that sort specified? Indeed, the first amendment seems to authorize free speech on any and all occasions citizens may choose, perhaps (oh, horror!) on occasions in which others are speaking as well. Perhaps we should regard appropriate, limited injections of heckling not as a threat or unwelcome annoyance, but as colorful invitations to democratic dialogue. Three roughly associated events from many years ago helped focus my understanding of these matters. One was a visit to the Free Speech Corner in London's Hyde Park during on a summer backpack tour of England while I was in college. As someone in love with politics and political philosophy, I eagerly sought out the fabled place on a cloudy July afternoon and was astonished by what I saw and heard. There in the plaza were several amateur orators, standing some distance apart, often on flimsy wooden boxes, declaring their views on a variety of social, political, moral, and cultural topics – ban the bomb, animal rights, the best path socialism, post-colonial African movements, and other topics. As a well-domesticated middle class American, I was shocked to see that the speakers at the front were not the only ones shouting. Some of the people in the crowd were vigorously and loudly yelling back. "Nonsense!" "Not true!" "Aw, you're full of it!" It was all part of a customary, evidently well choreographed ritual in which the hierarchy that separates speaker and audience simply dissolves. It's worth noting that during the afternoon everyone said whatever they wanted. Everyone was heard, nobody was silenced, for what it was worth. True, little in the content of the exchanges was particularly profound. But I came away thinking, "Yes, this is part of what free speech involves." The second event -- a rather lengthy and complicated one -- was the Free Speech Movement (FSM) at U.C. Berkeley during the fall semester of 1964 an upheaval that happened shortly after my visit to Hyde Park. The short version of the story is that, responding to complaints about political advocacy on campus, the foppish university administration decided to ban all political speech and was met by stiff student and faculty resistance. After weeks of demonstrations, protests and the arrest of some 800 students at a sit-in in the administration building, free speech on campus was finally restored. As I’ve written elsewhere, those events brought profound, lasting effects to my own life and worldview and to thousands of other students as well. The third event took place during the next year or so following the victory of the FSM and the rise of increasingly intense, widespread student concerns about the U.S. war in Vietnam. One evening in the university's Wheeler Hall auditorium, a speaker from a federal government agency, William G. Bundy (brother of McGeorge Bundy, key advisor to President Lyndon B. Johnson at the time), came to explain the Johnson administration's views on the threat posed by what he described as North Vietnamese Communist infiltrators to the government of South Vietnam. Some months earlier, a State Department document, "Aggresion from the North, a State Department White Paper on Vietnam,” had been released and became the focus of a heated nationwide debate. That evening, Mr. Bundy defended the report’s findings and offered justifications for an increasing U.S. presence in the war. For most of the time, the audience in the packed house listened quietly, even pensively to his remarks. But on several occasions, there were spontaneous shouts from the crowd: "That's a lie!" "Bullsh*t" and the like. Bundy, a career D.C. insider, one obviously used to polite beltway policy briefings, seemed shaken by these outbursts. As the heckling continued off and on during Bundy's presentation, his host for the evening, Robert Scalapino, Chair of the Department of Political Science, stepped to the podium and angrily addressed crowd. Drawing attention to the victory of the FSM, he excoriated those who'd raised their voices, dismissing them as contrary to the renewal of free speech at the university. The audience seem chastened by his warning and jibes from the audience gradually died down. Thinking back on its now, it seems to me that what was wrong that night, what was truly unforgivable during the build-up to the War in Vietnam, was not too much heckling, but far too little. We were too easy on the stuffy, self-assured Mr. Bundy and those like him in Washington as the calamities in Southeast Asia became known. Students and other citizens should have been tirelessly “in your face” as these policies and military campaigns took shape. Reading recent histories of the war, Nick Turse's Kill Anything That Moves most notably, has further convinced me that it was a blunder to heed the advice of those who urged us to be "polite and respectful" in our opposition. Much the same can be said about political controversies in our own time. Was a polite, respectful approach at public gatherings the best way to respond to the Tea Party candidates of 2011-2012 or their eventual standard bearer, Willard “Mitt” Romney? Obviously not. Think of the treasure trove of unwitting self-revelations in Mr. Romney’s quest for the presidency that were prompted by hecklers in the audience. An interesting question arises here. Was the American electorate better informed about its real choices in the 2012 election by (1) the hundreds of millions of dollars spent on the candidates’ beautifully tailored television advertisements, or (2) the memorable images and statements generated in response to well targeted heckling? In my view, the answer is perfectly clear. It's likely that history will record that several of Romney's "off message" comments were the ones ultimately decisive in his defeat, including his baffled retorts to ordinary citizen hecklers, phrases that came to symbolize his irrepressible contempt for the "47%" and more of the nation's populace. While arguments against the practice of lively, limited, thoughtful heckling are usually offered as a sober, reasoned defense of democracy, upon closer inspection they are often thinly veiled justifications for authoritarianism. The underlying, unspoken advice by very serious people is this: Be quiet. Be compliant. Don’t speak out. Don’t question authority. Put your little minds at ease. Just follow your designated leaders. Let them do the talking. If you must make noise, just applaud or cheer at the designated moment. My mind swims as I remember the astonishing array of fools, miscreants, looters, and, yes, war criminals for whom my generation has been asked to accord deference and esteem. Perhaps it was always thus. On the lecture circuit for has-been dignitaries these days, a reliable rule of thumb is: the greater the crimes, the higher the honoraria, the more piteous the vapors of apology if anyone embarrasses the institution by daring to speak out. So, I say, thank God for CODEPINK and for all those over the years who’ve relentlessly tried to heckle us back to our senses. While it's a mode of political expression sometimes prone to excess, abuse and sheer irrationality, on balance the practice of heckling stuffed shirt power holders can be counted among strongest, most colorful, most effective traditions of direct democracy. We need more of it, not less.